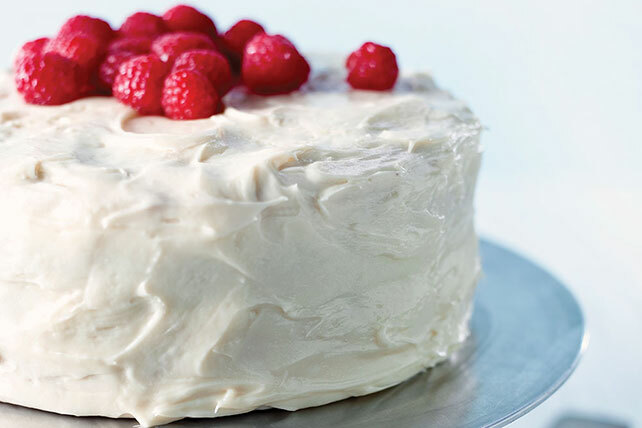 Bake a spectacular White Chocolate-Raspberry Cake for a special occasion! You simply can't go wrong with this beautiful White Chocolate-Raspberry Cake. Grease and flour 2 (9-inch) round pans; set aside. Microwave chocolate and butter in medium microwaveable bowl on HIGH 2 min. or until butter is melted. Stir until chocolate is completely melted; cool slightly. Beat cake mix, milk, eggs, vanilla and chocolate mixture in large bowl with mixer until well blended. Pour into prepared pans. Bake 25 to 28 min. or until toothpick inserted in centers comes out clean. Cool cakes in pans 10 min. ; remove from pans to wire racks. Cool cakes completely. Place 1 cake layer on plate; spread with 2/3 cup White Chocolate-Cream Cheese Frosting, then jam. Cover with remaining cake layer. Spread top and side with remaining frosting. Top with raspberries just before serving. Savor a serving of this indulgent special-occasion dessert that is perfect for a party. One cake makes enough for 16 servings. Prepare batter as directed. Remove 1 cup; place in small bowl. Stir in 2 Tbsp. seedless raspberry jam and 2 drops red food coloring. Spoon remaining batter into prepared pans. Drop spoonfuls of pink batter over plain batter in each pan; swirl gently with knife. Bake and frost as directed.